Minted now offers the best-designed Eid assortment—which truly reflects the celebration’s meaning—available anywhere. I was more than excited when Minted gave designers the opportunity to create Eid-ul-Fitr cards. It was fun to transform those traditional elements into something clean and modern. Minted (http://www.minted.com), the online store powered by a global design community, announces the launch of its first Eid card collection. The collection is comprised of 17 unique Eid cards, all crowdsourced from Minted’s International Celebration Challenge and voted on by thousands of consumers. “Gracious Star,” created by Minted designer J.Bartyn, is the winning Eid card design of the International Celebration Challenge. “I've been smitten with Islamic geometric patterns and style ever since I designed invitations and stationery for The Mosaic Foundation, a non-profit organization founded by the wives of Arab ambassadors,” said Cambria Evans, the designer behind J. Bartyn. 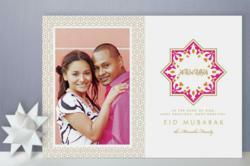 “As a Muslim-American I jumped at the opportunity to create Eid cards on Minted.com! It is such an honor to be able to help spread the spirituality and happiness that Eid represents. It's wonderful that Minted has opened its doors in welcoming multi-faith based holidays, enabling me and other designers to share our beliefs through art, beauty and creativity,” says Lena of the challenge. Ponn Sabra, the founder and owner of American Muslim Mom, an online community for American Muslims, was the guest judge for this challenge. Ponn chose the design “Arab Window” by Ana Sousa for her judge’s award because of its uniqueness. Minted's mission is to allow consumers to discover design genius from all over the world, providing an opportunity for designers to build their careers on merit alone. Minted holds monthly design challenges to source designs from a large global community of designers. The Minted community selects the best designs in a highly competitive and meritocratic process, yielding a top selection of the freshest, finest cards in the world. To that end, Minted's 2011 Holiday Card competition was the company's biggest challenge yet: over half a million votes were cast for 2,554 designs, and the top contenders were chosen by Minted's community for sale. Minted is a venture-backed design community and online store, crowd-sourcing graphic designs and content from a global design community and selling those as premium printed paper products initially focused on the $10 billion stationery, invitations, and cards market. Minted has radically transformed what consumers now expect in wedding invitations, Christmas cards, save the dates, birth announcements, business cards, and other personalized stationery. The company's paper and printing is of the highest quality and it leads the market with the freshest designs, newest formats and most coveted details. Minted's fresh, unique designs have been featured on The Today Show and The Early Show, and in Real Simple, Town & Country, InStyle Weddings, Food & Wine and other major national magazines.